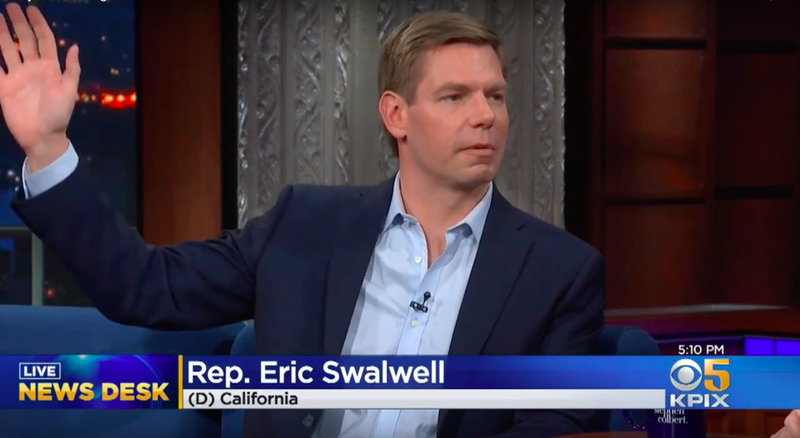 California Representative Eric Swalwell announced his candidacy for president on The Late Show with Stephen Colbert last night, bringing the total number of Americans demanding that Eric Swalwell run for president to exactly one. It also brings the total number of candidates officially running for the Democratic Party presidential nomination to a whopping 18. I recognize no copyright of any kind on this work. You have my unconditional permission to republish it or use any part of it in any way you like, or any of my other writings. My work is entirely reader-supported, so if you enjoyed this piece please consider sharing it around, liking me on Facebook, following my antics on Twitter, throwing some money into my hat on Patreon or Paypal, purchasing some of my sweet merchandise, buying my new book Rogue Nation: Psychonautical Adventures With Caitlin Johnstone, or my previous book Woke: A Field Guide for Utopia Preppers. The best way to get around the internet censors and make sure you see the stuff I publish is to subscribe to the mailing list for my website, which will get you an email notification for everything I publish.